Kingsway’s Morgan Robinson has developed into a leader and the team’s leading scorer. 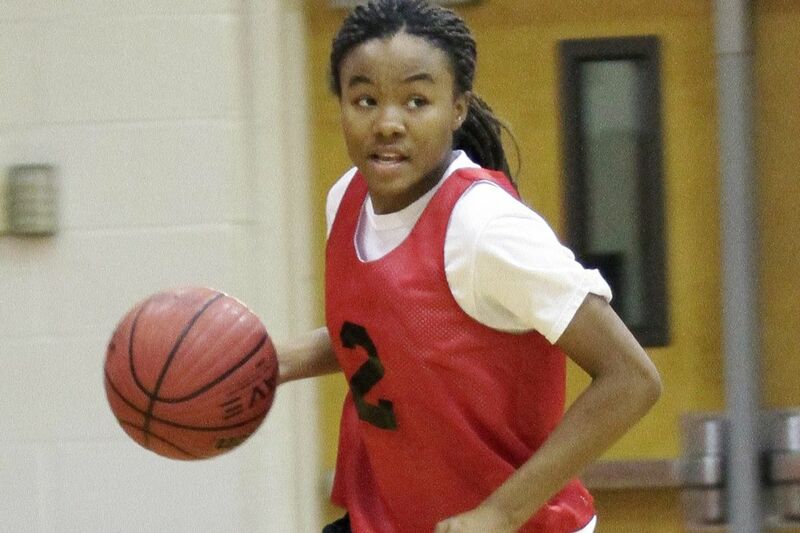 When college coaches ask about Morgan Robinson, Felicia Jenkins tells them Robinson has to be seen to be appreciated. "The tape does not do this kid justice," said Jenkins, coach of the Kingsway girls' basketball team. And Jenkins will tell stories of how Robinson, without words — just by a look in her eyes — can get teammates to follow her in pressure situations, make them work harder. She'll talk about the effort that Robinson gives, a motor that sometimes makes opponents look comical. Robinson, in a game's biggest moment, might grab a rebound under the basket on the defensive end, burst into a sprint, outrun everyone on the court — even those who had a big head start — and find herself alone at the other end for an easy layup. That play, it turns out, is common for Kingsway this season. "She's a program changer for anybody," Jenkins says to those coaches, who have been taking increasing notice of late. "She's electrifying. She brings an energy that you have to be in the gym to fully understand." Kingsway, by most estimations, was set to be in rebuild mode this season after some key losses to graduation. But, as is her style, Robinson — a shifty, lightning-fast junior point guard — emerged out of nowhere and is running circles around opponents. Her Dragons are 13-1, ranked among the top teams in South Jersey after barely being on the area's radar to start the season. And Robinson is averaging 18 points per game, up from just 9 points per game last season. "It's a tribute to her and to her attitude," Jenkins said. "And we spoke candidly before the season. She was flying under the radar a little bit on the recruiting scene. And the biggest knock on her was that because she plays too unselfishly she wasn't taking a lot of shots. "I told her, 'It's your time. You have to shoot more. You have to lead this team.' And she's doing it." Robinson is unassuming and humble off the court. She appears to relish the spotlight during games, but it's fueled entirely by a competitive nature. Off the court, she's not going out of her way to seek attention. "I like the pressure during the games, and the one thing I try to do is bring as much energy as possible," Robinson said. "I'm lucky that I have great teammates. I support them, and they support me." Robinson said she understood her new role coming into this season, and she worked last offseason to make sure she was ready. The work paid off. And her knack for taking over games has been obvious. She stole the ball and scored in transition to open the overtime period against Shawnee on Dec. 30, and she went 4 of 4 from the line in the extra period to carry her team to its first signature win of the season. On Jan. 20 against Paul VI, she scored a season-high 27 points, willing her team to a one-point win against its toughest opponent of the season so far. "I'm just trying to do everything I can to help our team reach our goals this year," Robinson said. "Honestly, that's been my biggest focus." Still a pass-first point guard by nature, Jenkins said her star player is bringing out the potential in the players around her. By elevating her own game, Robinson has elevated her teammates and the expectations for the team. "She'll still make passes when she could very well take the shot herself. But we are seeing her take and make those big shots," Jenkins said. "She's bringing the rest of these young ladies up with her. You never see her drop her head. You never see her scold a teammate. … She's the ultimate teammate."